It happens a lot when I'm driving, as well as on those rare occasions when I'm on an airplane. I'll be puttering along on the freeway and ahead of me there's an exit sign that says "Ocean Beaches" or a sign pointing to "Seattle next exit," and I'll think, why not? Or maybe we're sitting on an airplane and the flight attendant announces the landing time for our destination and then says, "For those passengers continuing on to Paris…"
Well, lately—okay, honestly, since the election and the resulting chaos on the national scene—I've been alternating between covering my eyes to avoid seeing pictures of you-know-who and getting sucked into watching Alec Baldwin on Saturday Night Live. So lately the pull to take that exit off the freeway has been almost irresistible. Fortunately for me, a friend had a birthday coming up and, instead of trying to buy a gift—which is always fraught with uncertainty for me—I thought, hey, I'll bet she needs a jaunt out of town as much as I do! 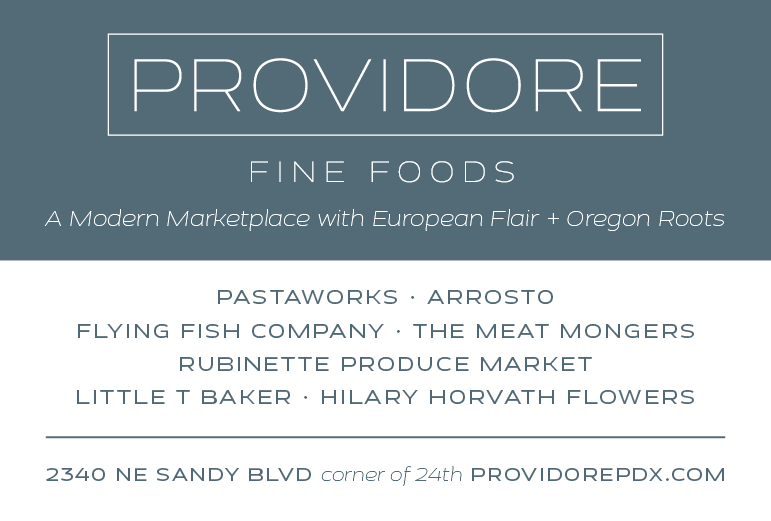 My favorite hands-down jaunt destination is the beach, just a 90-minute drive from PDX, and whether it's Astoria's historic, working port appeal or the taffy-and-Haystack Rock lure of Cannon Beach, there's really no wrong direction. Both drives are scenic, with a choice of forested vistas or a meander along the Columbia River, and easy driving, especially on a weekday. 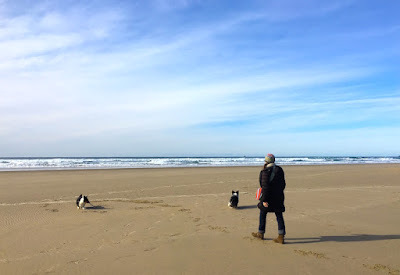 And, of course, Kitty and Walker had to come along, especially since my friend was the lifelong caretaker of the departed ür-Corgi, Tai, who got us started on this big-dog-with-short-legs journey in the first place. Plus Corgis seem to be drawn to the waves like…well…like seagulls to the beach, so it was a win-win-win all the way around. Even though we got started a bit late, at 11 or so in the morning, we made it to Cannon Beach by 1 and were walking on the beach moments later. I tend to avoid the section of beach near the touristy downtown and opt instead for pulling into the tiny city park just before hitting the main drag. 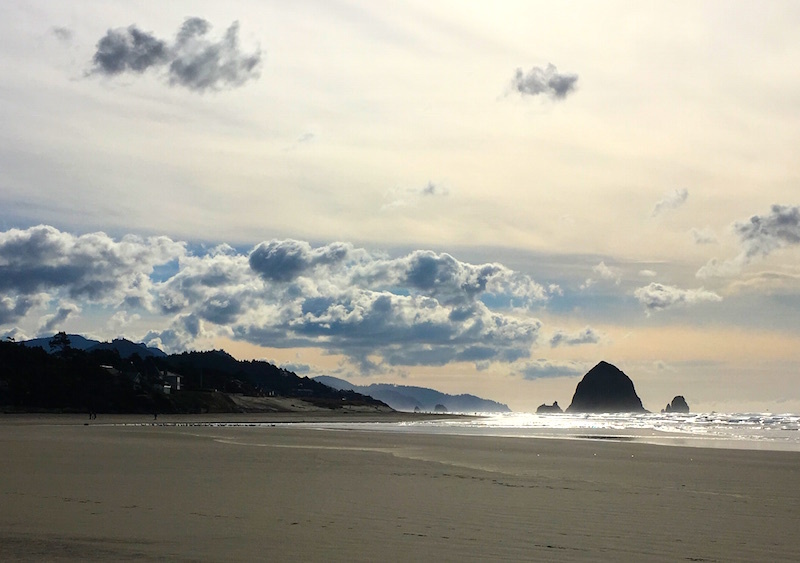 It's separated from the Haystack Rock area by a creek, which tends to discourage the tourists from crossing it and makes for a nice quiet walk up to the bluff on the north end of town. 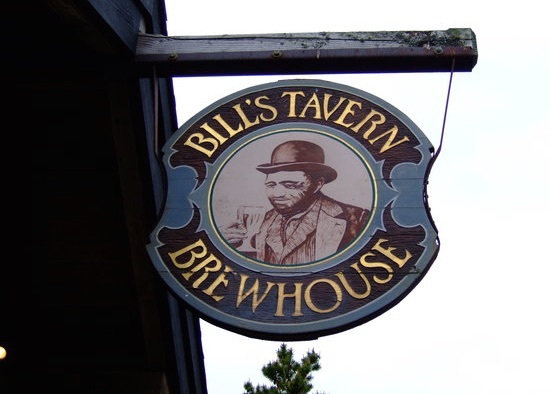 We were, of course, starving by the time we made it back to the car an hour later, so we zipped into town and nabbed a comfy booth at Bill's Tavern & Brewhouse where I had a lovely pint of their IPA to go with my spinach salad while my friend gobbled down their chopped salad. Despite the dire weather prediction, it was still astonishly gorgeous out, so we drove down to the south end of town and went for another stroll on the beach before heading back home. With tired puppies, clearer heads and the memory of a perfect few hours on the beach to hold onto, it was just what all of us needed.